This will be the first anniversary of X LAKES SUMMER and what a success story it has become. All the participants agree that the concept is awesome and most came back to do the X LAKES WINTER. X LAKES SUMMER will be similar in format to X LAKES WINTER with one or two changes. 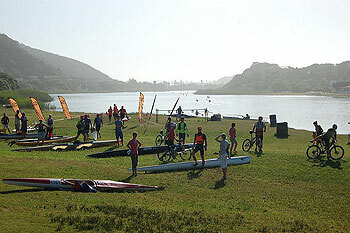 The start venue at Touw River Mouth worked so well and the extended first MTB section received such positive comment that we have decided to keep this for X LAKES SUMMER. 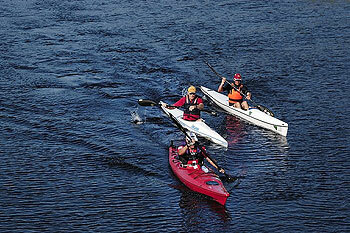 The event will start with the paddle from the Touw River mouth to Island Lake. The reason for this is the two mountain bike legs are longer than the previous summer legs were. This paddle section should take about an hour for the middle of the pack. There could be a bottle neck in some parts of this section as the paddlers negotiate some of the narrower parts of the Serpentine River. It will therefore be advantageous to put a bit of effort into the first part of the paddle so as to avoid any bottlenecks. Coming out of the Serpentine and entering Island Lake you will make a sharp left to ensure you take the shortest line to the transition point at the western end of the picnic area to bikes. The Serpentine can deliver a curved ball depending on the level of the river, so our advice is to use a craft with a flip up rudder which will help if there is reed in the river. This will give you a few extra seconds on those with fixed rudders. Remember, you can change your craft from the first to the second paddle legs. The MTB route will mean that the times to Bay Water Village (next to Pine Lake Marina) are not going to be as quick on this leg as with the previous X Lakes Summer but the seconds (or paddlers, if you are a team) will have to be fairly well versed in loading the canoe in order to ensure they get to Bay Water Village before the bikes do. As the second, you must take the N2 (which will in any case be quicker as it is the shorter route). This section is going to be awesome with at least one tough climb although you will be rewarded with lots of off road riding. This section will take the leaders about 40 mins. This section will consist of gravel roads and single track but the single track will not be technical. The cut off time to start this paddling leg is 12h00. 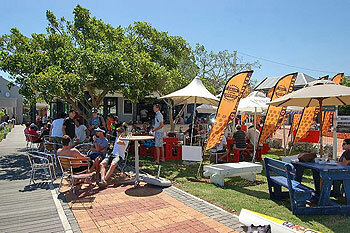 This is because it is unlikely that you will finish by 16h00 if you have not started paddling by 12h00. No one missed the cut off in the 2012 X Lakes Summer. This paddle section will be a similar length to the first section and will require you to paddle across Swartvlei to a buoy and then up the KARATARA River. It is possible that there may be wind on Swartvlei as with X Lakes Summer 2012 and this can give rise to waves up to 30cm high or more. You will have to cross these waves at right angles so it will be imperative to choose your craft wisely. A K1 may not be the best choice unless you are very comfortable with the craft. You are allowed to substitute water craft so if you have chosen to use a K1 and you fall out at Swart Vlei you may be in for a long swim. Remember to use your splashy as this was the downfall of a few competitors for X Lakes Summer 2012. Similarly if you choose a water craft that is too slow you may be out there for a long time. Ideal craft will be stable K1s for the experienced or surf skis although fast touring canoes can also be used. This section will be similar to X Lakes Summer 2012. 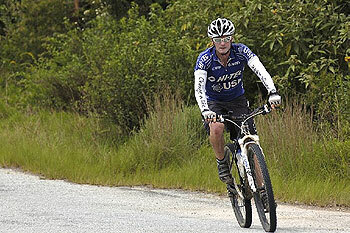 We are however looking to incorporate more MTB riding which means taking the track less traveled. Nevertheless the long up hill which takes you towards KARATARA remains which then links up with the old George – Knysna road and ends with a long down hill down Phantom Pass. In between, is the not to be underestimated Homtini Pass. The route will mostly be gravel and there are no difficult technical sections of Mountain Biking. The down hill sections down the Homtini and Phantom Passes promise to be spectacular. This should take the average rider about 3 hours to ride. This is the last paddle and will take the average paddler about 70 minutes to complete. There probably will be some head winds on the day and some boat traffic which will have to be taken into account. The current may also be with or against you and this will affect your time. As noted above there could be significant waves up to 30+ cm high as you round the jetty near the finish. These will vary in height depending on the wind, tide and other boat traffic, therefore your craft choice will be critical. 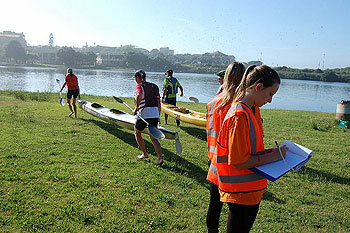 Your finish time will be taken when you or your team mate cross the line in the canoe. You will then be welcome to enjoy a well earned drink and relax at Tappas restaurant. This is where you are going to need to be quick if you are looking for a good time as with all these type of events, a race can be won or lost on the speed of transition. A word of warning, any speeding of vehicles (driving at more than 15km / h) within 1 kilometer of the actual transition zone will result in immediate disqualification. Also note that the second driving the car must use the N2 and not follow the cyclists along the back road. Marshals will be placed at various points to check that no vehicles second their cyclists. All seconding must be done at the transition points. This is not a complete list and each participant should be aware that he/she needs to plan according to his/her race-plan. The list below is compulsory and will be checked by marshals. If the participant does not have the equipment with him, he/she will be disqualified. Approved Personal Floating Device (PFD) that will support the individuals’ weight in the water. Waterproof Cellphone or normal Cellphone in waterproof pouch that WORKS! 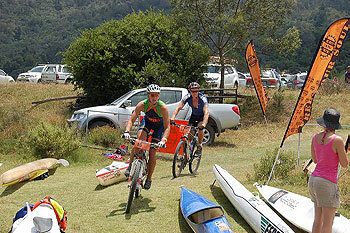 MTB/Canoe Duathlon that can be done in a 2-man Team or Solo format. Four transition points.